Digital capture is customized to your specifications. All analog tape formats are digitized using the best analog output the format has, whether it be component, composite or Y/C. Analog signals are then digitized to 10Bit uncompressed video and 48khz 24 bit audio SDI signal. Our facility is equipped with digital routing to any capture station. The only compression applied is that of the codec requested by the customer. Betamax, MII, 1”, 3/4”, VHS, Hi8, 8mm. HDV, DVCam, DV, DVCPRO, D2, MII, 1”, 3/4”, VHS, Betamax, D3, Hi8, 8mm, Digital8. Any of these can be converted to a digital file in a wide variety of file formats. When capturing the video, it is always captured at its highest quality using the best interface possible. Digital tape formats utilize the SDI output on the playback units so we can offer a digital copy of the data on the tape. The video is never compressed unless it is to the codec of the target format. For HDV, DV, and DVCam we can capture either the SDI video or the datastream on the tape. 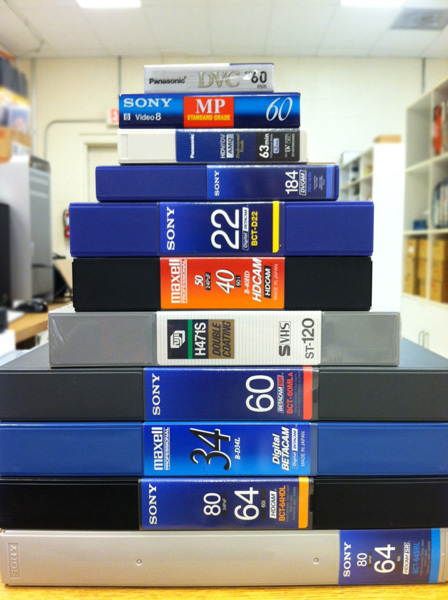 Digital Tape Formats: HDCAMSR, HDCam, Digital Betacam, IMX, Beta SX, HDV, DVCam, DV, DVCPRO, D2, D3, Digital8. Have a library whose assets include video tape. We can encode to the best possible quality files and include inspection and other information about the tape. Closed Captions, VITC and VANC information recorded to file. Our Sony 1" tape machine, for recording and playback.